I just love happy accidents! Don’t you? Well, I had one recently, when I was making some elk bone broth. It turns out, there was quite a bit of fat on those bones and the leftover meat, and in the process of making this homemade bone broth, I also accidentally created elk tallow! I yielded about 12 ounces of it just from the few bones I used! Why would you even want to render fat into tallow or lard you may be wondering? Well, tallow and lard are just wonderful to cook with and make the flakiest crusts too. Also you can make handmade soap! Tallow is the fat from animals such as beef, deer, and elk. The fat from pigs and bear is called lard. Both tallow and lard are excellent fats for cooking, making soaps, candles, and using in body care products because of the very rich fatty acids it contains. By the way, if you have issues with hunting wild game for food, please read this article: Don’t Eat That Meat! Stop Supporting the Abuse of Animals. In fact, please read it anyway! It’s really interesting, and it’s information every single person should know about. The Meat article was a labor of love after I received a hideously mean comment from a person on Instagram about our lifestyle. I decided to do a TON of research on how your grocery store meat is raised and treated so you can make good choices about the food you feed yourself and your family. Regardless of your feelings, you deserve to know what’s going on in our meat industry here in America. At any rate, if you are curious, yes, Mr. V. did shoot the elk in question. And yes, we use every single part of the animal we can (and we are learning about more and more ways to use all the parts). And yes, we do have a moment of gratitude and thanks for the animal as it gave its life so we can eat. We do not take hunting lightly, and we do not hunt for sport. We hunt for food. 1) One Second After by William Fortschen. Mr. Fortschen has worked with the government and is highly knowledgeable about EMP’s (Electromagnetic Pulses). He walks us through what our lives will be like should we ever be affected by one, either through terrorism or through natural causes. It’s an excellent fiction book, based on facts, and an interesting and engaging read. You probably won’t want be able to put it down. This book underscores the importance of having self-sufficiency skills. 2) Any book by Joel Salatin is excellent for giving you a small farmer’s viewpoint of our food industry. I highly recommend any of his books, but I especially love Folks, This Ain’t Normal. You’ll read about the food industry and how difficult it is for the small farmer to actually feed local people due to Big Government and Big Business/Big Ag. 3) Finally, Michael Pollan’s popular book, The Omnivore’s Dilemma: A Natural History of Four Meals, is an excellent and fair-minded, experience-based treatise about the dilemmas modern people face about choosing meat to eat. He includes his personal experience with purchasing a calf and following its progress from birth to death. 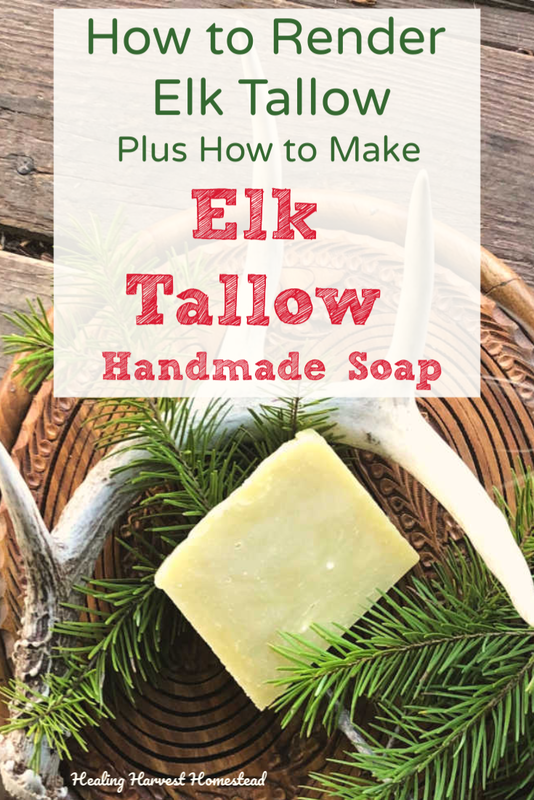 Back to the Elk Tallow! FTC Disclosure: There are affiliate links scattered throughout this article. If you click through any and make any kind of purchase, I may earn a small commission at no extra cost to you. I wasn’t thinking about learning how to render elk tallow (or deer tallow or any other kind of tallow) when I started out with my latest bone broth adventure. You see, I’ve made a TON of bone broth at this point, and it is a staple in our freezer and storage pantry. But Mr. V. handed me these enormous bones he had cut down, and they still had some of the meat and fat on them. I told him—that’s just fine! It will add to the flavor. So I proceeded with my bone broth like normal. Now, most people will simmer their bones for around 24 hours. Not me. I like to be sure as much of the marrow is used and it will be as gelatinous as possible. I tend to simmer mine for more like 48 hours, and sometimes even longer. I have a feeling this was how I managed to obtain such beautiful and a good quantity of tallow! Anyhow, when I turned off the heat to let the broth cool (along with the bones and everything else in it), I noticed this clear layer of fat forming at the top. And it kept on coming! When it was cool enough, I went ahead and put the pot in the fridge overnight, as it was late. I figured I’d strain it off in the morning. Well, when I woke up, and went to go finish straining the broth and bottling it up, there was nearly a half-inch of pure white fat (tallow) sitting on the surface! It was the cleanest fat I’d ever seen! So, I just picked it up and placed the chunks in a glass jar for later use. But first I weighed it. I wanted to see if just maybe I had enough to make some tallow soap! Turns out….I did! And that’s how I made this accidental batch of elk tallow. This is a pretty common method, and I understand it is less messy than wet rendering. Basically, you cut all the meat off the fat. Then you place the fat into the freezer overnight. This allows the fat to be easily cut into chunks or pieces. Some people, it turns out, actually put their fat through a meat grinder. Personally, I don’t think I’d choose to do this because by some accounts it can gum up your machine. But I have never tried it myself—-maybe you have? Then you place the fat into a crock pot on low heat or over a stove on low heat. Some people do this outside because I guess it can become stinky? My bone broth just smelled like bone broth, though. You allow the fat to heat up and melt. Once it is melted, the impurities (any skin, extra meat, etc.) will “cook” and become crispy, rising to the top. You just scape this stuff off with a slotted spoon. Keep in mind the fat is VERY hot. Once no more cracklings are rising to the top, your fat is rendered! Just carefully pour it into heat proof containers and let it solidify back up again. The benefits of dry rendering: It’s pretty easy. You can even use a crock pot. With the wet method of rendering fat, all the directions start out the same. Get your suet (or fat) cut up into chunks. Then you just boil the fat in water. What happens with this method is that the waste portions of the fat will sink to the bottom of the pan, while the melted fat will rise to the top. When all the fat is melted down, you just cool down your pot, and the fat on top will solidify. This is actually what happened (unbeknownst to me) with my elk bone broth! The pros of wet rendering: You get a beautiful, clear and clean tallow or lard. The cons of wet rendering: Some people say it’s more difficult, but I just don’t see how that can be. I wouldn’t think there’d be any cons. In fact, when I get the chance to obtain a nice hunk of fat from around the kidneys and organs of the next animal Mr. V. hunts for or from my friend who owns a small cattle farm down the street, I plan to wet render the fat. Here’s a close up of the elk tallow. Isn’t that just beautiful? It’s pure and white. OK. So now that I’ve done a bit of research (that was quite fascinating), I can draw some conclusions about what happened with my bone broth. You see, with most bone broths, you are not dealing with a lot of meat left on the bone (or any if you buy them from the store) and very little fat. You’ll have the marrow and hopefully if you give your broth some time, you’ll end up with lots of minerals and a gelatin rich broth. My bones were fresh from the animal and still had excess meat and fat on them. So as I was simmering my broth over a period of two and a half days, all the fat that was left melted off the bones. When I went to cool the broth in the fridge that evening, the fat rose to the top in a pristine white layer, while all the bits sank to the bottom along with the bones. The broth, of course, remained in the middle. This is really wonderful soap. It’s now one of Mr. V.’s and my favorites! Now, I could have cooked with that lovely tallow, and I tell you, I was tempted. I love pure fat that is unadulterated and (therefore) actually good for you. But I have been wanting to make tallow soap FOREVER, and I just couldn’t help myself. I created this recipe specifically for tallow that comes from the deer/elk family. **You see, tallow and lard have different amounts of the fatty acids that go into making a nice bar of soap—this is important in creating a soap recipe. Also, they have different saponification values (the amount of lye needed to saponify a portion of the fat into soap, to be simple about it). If you are interested in using a different kind of tallow (like beef, which is pretty common), definitely take the time to run your measurements through a lye calculator, as the water and lye amounts may change. I like this calculator from SoapCalc. It’s super reliable in my experience. By the way, I made this recipe and tested it using the hot process method. I have not tried it with cold process, but I don’t see why it wouldn’t work out. It’s got a 5% superfat already calculated into the recipe, and it will make two pounds of soap. If you are new to soap making, PLEASE be sure you read through some complete tutorials first. This is important because soap making using lye can be dangerous if you are unfamiliar with how to work with it. And you’ll probably LOVE to have my hot process soap making printable checklist with basic instructions so you don’t forget anything (trust me: it’s easy to do—ask me how I know ;-) You can find a link at the bottom of the this article! OK, now on to the recipe, already! You can make your own hot process soap! This is the ultimate guide, with a no-fail recipe and over 22 recipe variations. Lists & charts of herbs, clays, and essential oil blends for soap round it out! This soap recipe will make two pounds of soap. It’s high in Oleic Acid, which makes for a super conditioning bar of soap. It’s also got a good combination of Lauric and Palmitic acids, and this makes the soap lather and clean well. I’m pretty impressed with it, actually! NOTE: I get my essential oils for soap making from Starwest Botanicals. I didn’t color it with anything, but you could. Follow the directions for making hot process soap, which you can find in the articles already mentioned or in the ultimate guide to making hot process soap! I love Jan Berry’s books! I learned to make soap from her, and she is definitely an expert! Find out more! This was a great experiment that actually turned out! In fact, I wasn’t even planning to experiment with making tallow—-it just accidentally happened. I was thrilled! Anyhow, when you can use all the parts from an animal you harvest, that is just the best feeling. Mr. V. and I are continuing to expand our skillsets in this regard so we can be as sustainable as possible. The reasons are varied, and they are all important. We want to be as self-sufficient as possible, for one thing, because you just can’t trust the foods in the stores anymore. It’s a bunch of contaminated chemical laden stuff. Also, there is a feeling of empowerment you get when you start taking steps to do things yourself. It’s like no other feeling to no longer be at the mercy of the stores and whatever big business tries to make us believe. Finally, your health and the health of your family is positively affected when you learn to make things yourself and do it yourself. Don’t forget! You can get my Hot Process Soap Making Checklist along with access to my growing free resource library full of printables, eBooks, charts, and more on all the kinds of topics I share on the blog in the form below. When you complete the form, you’ll get the password immediately! There’s lots more over on the blog, too! www.healingharvesthomestead.com. Go search around!